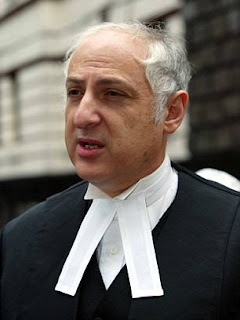 You may have read my recent report for Al Jazeera on the view of Lord Carlile QC, a new member of the Bangladesh opposition leader's legal team, about the conviction of Khaleda Zia, for embezzlement. If not, you can read it here. In summary, he said, that following a review of the relevant documents he had "not seen any evidence whatsoever that could justify prosecuting Begum Khaleda Zia, let alone convicting her"
Many people, quite understandably, will say that as a member of the defence team, the QC "would say that wouldn't he." That is of course a fair point. When I asked Lord Carlile exactly that, he claimed he was not saying this simply because he was part of Khaleda Zia’s legal team. I shall be writing more about the case tomorrow. "a number of e-mails from a first secretary at the High Commission asking me questions that were completely irrelevant to my application – asking me if I had a license or permission from various entities in Bangladesh to do what I am intending to do – but all that I am intending to do is give private advice to a private client, and every Bangladesh citizen can get advice form any lawyer anywhere in world they like and of course they often do as there is so much trade between Bangladesh and the UK so it is inevitable that Bangladesh entities are getting commercial law advice on this. This has been pointed out to the First Secretary and has not been disagreed with and he has been provided with all information that he needs." "I have not been refused a visa but the [Bangladesh High Commission] know perfectly well that I want to be there on 7 May so I can be present in court on 8th and they are playing for time. ... I have not had a refusal, not had an acceptance, just this correspondence dance taking place." This is of course not the first time that the current Bangladesh government has stopped foreign lawyers from entering the country. In 2011, it stopped Toby Cadman, who was representing a number of leaders of the Jamaat-e-Islami who were on trial for international crimes allegedly committed during the country's 1971 independence war and a year later, the government is reported to have stopped Joe Cyr, a US lawyer from Hogal Lovell, who was representing BNP opposition leader Salauddin Quader Chowdhury at the time being prosecuted for similar offences.